There has been a ton of conversation around Facebook’s declining organic reach for businesses. I wrote about it recently in a very popular post on this blog. Continuing the conversation, my brilliant friend and collaborator Robert Rose from Content Marketing Institute wanted to get some thinking about Facebook from a few colleagues, so he asked me what I thought was really going on. He asked me to tell him what we’re advising corporate clients to do here at Convince & Convert when it comes to Facebook, and he and I wound up having a fun and robust email exchange on this topic. Also, Robert and CMI are simultaneously publishing our conversation on the Content Marketing Institute blog – with his own commentary. So, if you want another angle on this, you should visit there too. Jay: So, the Reachpocalypse post I wrote represents most of my current thinking about Facebook. But, essentially, yeah we’re getting screwed by Facebook. But, they have a right to screw us and marketers should have seen it coming. These are the things we are telling clients. 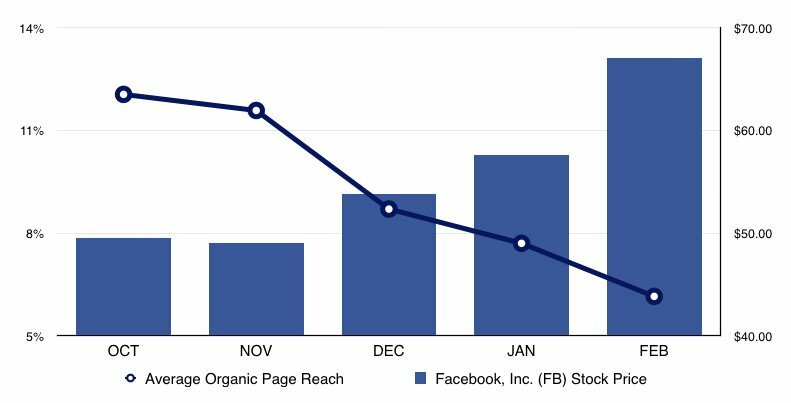 Those that have existing, thriving Facebook communities don’t want to give them up, and are paying (at least some of the time) for organic reach. Those that were never completely committed to Facebook, or those that are just starting (very often B2B organizations) are very much in the “bring on Google+” camp. Jay: Indeed, there is a difference between future growth and future usage. Future growth is going to be a problem, if for no other reason than Facebook is almost universally used now. When you’re at 60%+ penetration and your average user logs on for 30 minutes a day, you don’t have a lot of room to grow organically, other than acquisition. So, what they have to do is better monetize their existing user base, and get financial growth (if not user base growth) from that. Thus, the Reachpocalypse. They are trying to dramatically boost revenue per active member, and so far it’s working. I’m not sure for how long it can last though. Jay: It all depends on whether there is eventually a backlash against promoted posts/native ads. The integration of advertising and “content” works for Google search because on Google search you are actively seeking information/resources so the ads are almost inherently useful. It’s a different psychology on Facebook. People aren’t using Facebook at all times to find products or services. Sometimes, sure. But not all the time. That’s why I think they are actually smart to make it harder to succeed with inferior content on their platform, with moves like increasing ad prices, the 20% text rule, and Reachpocalypse. These moves favor bigger/smarter companies that might more often actually create ads that people like/want to see. It’s counter-intuitive, and perhaps not infinitely scalable, but it’s the online version of the cheesy infomercial vs. savvy product placement juxtaposition you see on cable TV. Hyundai inserts their brand into Walking Dead and it’s smart and tolerated. Sham-Wow less so, and it’s relegated to the insomnia time block. Robert: But I think you’ve got the key there – it’s now an Ad Play not a Social play. They’ve backed themselves into the publisher corner – where the idea is to get ads in front of eyeballs (native or otherwise). That puts them squarely in competition with other publishers doing the same – and with no better (in fact in some cases worse) qualitative reach. And that’s ultimately a race to the bottom from a margin standpoint (not to mention a quality standpoint). And, meanwhile, they are disenfranchising the very smart brand content providers they are trying to leverage. Yes, Hyundai now moves money to Walking Dead – ShamWow moves money – temporarily – to Facebook. So – short term – Facebook is a great place for me to put ads to pull people back into my owned media properties (promoting content or otherwise). Long term – Facebook becomes like regional TV – where local car dealers fight it out with Devry Institute covering hyper local DMA’s. To me – the whole thing could have been avoided if they had only made the “Like” really worth something. You know, limited it in some way (e.g. give a quota of likes for brand pages). By doing that – they could have made “Likes” a currency – and sold that to brands. Instead, the only way for them to make money now is to extract a higher revenue per subscriber. Jay: Yes, the Facebook-as-a-publisher concept is very interesting. It’s a known business model leap. Look at YouTube going hard into the original content game. Or Amazon, for that matter. 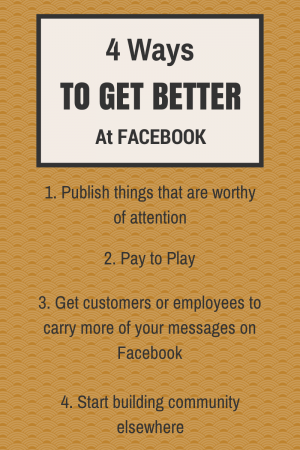 I’m not sure Facebook sees their competition as other publishers, however, especially online. I think they see their competition as broadcast and spot TV. Nothing but TV has Facebook’s reach. That’s why the video ads on Facebook will be so critical, and aren’t getting talked about enough. Robert believes that Facebook is no longer a community, but is essentially a publisher – a vessel for advertising. From a business perspective he’s of course correct, but Facebook’s plans go much, much deeper, and what Facebook does on Facebook.com or via mobile app usage is only the tip of their strategic, tactical and revenue iceberg. As I wrote about in Facebook is much more like Verizon , Facebook is more like a telco than they are like a regular website. They want to be the dial tone of the Internet, at the center of any technologies that connect humans together (Instagram, WhatsApp, now Oculus). This puts them on a collision course with television and telephone, which are far bigger opponents (and far broader ambitions) than anything having to do with organic reach and business Facebook pages.